By the providence and will of God, our Blessed Mother was not at the foot of the Cross alone. She was joined by two other holy women as well as by Saint John the Apostle. Together they stood at the foot of the sacrifice of Jesus. The strength of our Blessed Mother was unmatched. She and she alone could have stood at the foot of the Cross gazing in faith and perfect trust as she watched her Son endure His sacrifice. However, it was the will of the Father in Heaven that she not endure this alone. She was given certain spiritual companions with whom she would walk through this suffering. In many ways, our Blessed Mother was more of a pillar of strength for her companions than they were for her. But we can also be certain that she allowed the companionship of Saint John and these holy women to bring comfort and strength to her own heart. It is not the will of God that we face the hardships of life alone. Even if we were as strong and immaculate as our Blessed Mother, we could still be certain that God would want us to face the challenges of life with the assistance and consolation of others. Human life is made for communion with one another. Offering and receiving strength and consolation makes up part of who we are. Therefore, we must allow this holy scene at the foot of the cross to remind us of our need for the spiritual friendship of others. We must daily seek to embrace those friendships that God has given us and be open to new ones that He sends our way. Reflect, today, upon two things. First, reflect in gratitude upon the people in your life who act as a source of strength and support in times of need. No one but Jesus and our Blessed Mother will be a perfect support, but if we are open, we will come to realize that there are many whom God uses to offer us strength and support in various ways. Reflect, also, upon those who need your spiritual friendship. Who has God placed on your heart to reach out to and to console? Stand with them, at the foot of their daily crosses, and together you will be gazing at our Lord Himself. 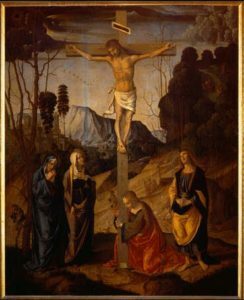 Dearest Mother, as you stood at the foot of the Cross you were joined by Saint John and the holy women. You allowed them to be a source of consolation to you who were immaculate in every way. You invited them into your own grieving heart and allowed their mutual love of your Son to bring you joy and strength. Dear Mother, draw me also close to your heart. May I also become a spiritual consolation to you in this agony. As I do so, I trust that this closeness to you will also be a source of consolation to me in my suffering and pain. I thank you for standing by me throughout life and I renew my trust in your motherly care. My dear Jesus, you draw me to Yourself and invite me to gaze upon You in Your agony. As I do so, give me the grace of true friends who will join me in my gaze of love towards you. May these friends strengthen me and may I always provide consolation to those in need.